My Personal Profile: I'm a pretty normal guy with normal interests, which means I probably need to get out more. And, well, sometimes I do, and sometimes I write about what happens when I do go out. My blog is a reflection of me as a whole, not just one particular flavor. Sometimes this means writing about awesome things. Sometimes it means writing about heartbreaking things. Sometimes it means showing my best side. Sometimes it means showing the side that should probably be kept hidden. I'm an explorer at heart, and my writing will generally reflect that. However, if there's a category you particularly like, please let me know. I'm certainly willing to focus more on those subjects that have an audience. I'm also a fiction writer, which you can read more about in the next (third-person) paragraph. My Author Profile (as written in the back matter of my e-books): Jeremy Bursey is the author of many short stories, essays, and poems, along with a modest number of novels and screenplays, each covering topics and genres that differ from what he had written previously. He hopes to bring many of these into the ebook generation over the course of the next few years. He holds a bachelor’s degree in English from the University of Central Florida and currently works at a local college as a writing tutor. He appreciates feedback for anything he offers to the public. So, every once in a while I write a blog that’s actually about coffee. I know, that’s unusual, seeing as how I’ve named my blog after the act of drinking coffee, yet for some reason I never actually write about coffee or drinking coffee. So, I understand if it surprises you that today we are talking about coffee. But, you shouldn’t be surprised. Anything goes on this blog. If I were to write about ant food or beach sand, you should think, That’s about right. So, today we’re talking about coffee. Specifically Dunkin’ Donuts coffee. Or, am I talking about Dunkin’ coffee? First of all, before you start reading this blog, or at least read more of it, you need to find yourself a good sandwich because, after all, drinking café latte at 1pm often means you should have a sandwich, too. What’s today’s sandwich? I recommend a croissant, toasted, with some kind of cheese, cheese at which you can pick for yourself, and we’ll say, er, ham. Actually no, bacon. Yes, you should be eating a breakfast sandwich today. Maybe one from Dunkin’. On Tuesday morning, I went to my usual Dunkin’ café on the college campus where I work and ordered my usual drink, a coffee with cream and caramel. No sugar. The workers there know who I am, and sometimes they’ll even have the coffee waiting for me when I get there. I don’t know if I like the idea of people knowing me so well that they know what I’ll order before I know. But, in the Alexa generation, I suppose I should get used to things like that. It never hurts to prepare for the robot apocalypse a bit early. So, on Tuesday, when I got into line and approached the register, the girl taking my order, before I could even give her my order, said, “We are out of caramel today.” I looked at her for a moment and said, “Okay, that’s fine.” Then, of course, she asked me what I would like instead. I thought about it for a second and told her I don’t know. I started thinking maybe I’ll take pumpkin, but then I remembered that we’re in April right now, and April is not the month for pumpkin. So I had to give it more thought. Thinking about what I want in my coffee when I don’t have what I want for my coffee can be difficult. I knew I didn’t want vanilla, which was one of the flavors she offered me. I didn’t want the other things she offered, either, which I no longer remember, but hazelnut sounded pretty good, so I ordered that. Now, to be clear, I’ve had hazelnut many times before, usually at home, but I rarely get it at Dunkin’. There’s no reason for that rarity, except that I prefer caramel or pumpkin, and if I’m feeling ambitious, caramel and pumpkin. But, today I had to get hazelnut because it was the best option I had and, in an industry that has sketchy flavor consistency, I didn’t want to take a chance on ordering something too bitter. After all, I had two dollars at stake! A couple of minutes later, I got my coffee and my food, two bacon, egg & cheese wraps, and it was good. I got back to the office, ate my wraps, and started drinking my coffee. And let me tell you, it was actually pretty tasty. I admit that sometimes Dunkin’ is hit-or-miss, which is why I get the flavors I know. Hazelnut is not a flavor I drink enough to form a consistent opinion about, so I can’t say if Dunkin’s treatment is generally bland or flavorful, but I can tell you that for that one order I rarely get, I got a good one. The hazelnut was sweet, with a little bit of woodiness, and it definitely complemented the coffee flavor that Dunkin’ is best known for, which is, of course, tasting like coffee. I know this sounds obvious, but this is a review, and coffee, from a place that everyone has ordered from many, many times before, needs a fair hearing as much as the next beverage. But, if you’re still reading this, then I think you’re here more for the entertainment than the actual review. This means that my actual review is not on hazelnut coffee at all, because it’s not new and I’m sure you’ve had it before if you have any coffee knowledge whatsoever, but on the new brand name Dunkin’, as opposed to the original, and far superior, Dunkin’ Donuts, which the company has been called for many, many years, well beyond my childhood, well past my, well, I don’t know how far back it goes, but it’s been Dunkin’ Donuts for decades, if not generations, and now it’s this new thing called Dunkin’, which is some short, sweet, brand name that maybe is hip, maybe is unifying, but it just seems not quite the same as what I remember as a kid or as an adult, and really where is the coffee and where are the donuts? So my review of Dunkin’, the name, is that I can say it faster, and honestly that’s how I’ve been referring to it for a while anyway, as Dunkin’ Donuts really does take too long to say. So, at the end of the day, I approve of the name change, but I wish they’d kept all of the original branding on their bags, because I’m a creature of habit, and what I’m familiar with it is not Dunkin’ but Dunkin’ Donuts. I’m only familiar with Dunkin’ when I’m calling it by name, in a hurry, because I need to go, get coffee, and come back, and I don’t have the time to waste talking to you about where I’m going; I just want to get it over with and get to where I’m going, which is Dunkin’. Dunkin’ Donuts. Okay you should probably check on your sandwich now. I’m sure it’s well toasted. Enjoy your lunch. Go to Dunkin’, get some coffee. I’d recommend the hazelnut. Almost two weeks ago, my old, trusty flip phone, an LG Lotus Elite, decided to flip me off when its primary screen went ultra-fuzzy, making it impossible to read. I was a little discouraged by that because it was a staple in my life, a constant companion that could do fancy things like tell me the time, and, other stuff I guess. Not that it was a good staple because friends often made fun of me for having it—due to it being a flip phone. But I’d used it for as long as I had because it still worked, I could still make phone calls, and I could text whomever I wanted, whenever I wanted. Granted, I could not send or receive emojis anymore, much to the consternation of many emoji fanatics who happen to live on my contacts list, and that’s been true for several years, and that disability had been a source of trouble every time someone would attempt to smile at me and my phone’s response was to report the message as “No Content.” But I’m normally okay with that because I don’t really care about emojis. Unfortunately, the people who text me are fans of emojis, and they would often send me emojis even though I tell them not to. Needless to say when my phone finally flipped me off two weeks ago, I had to get a new phone that could handle emojis. Now I don’t know how I feel about having a phone that can handle emojis because now I know people are going to send them to me every time they text. But I suppose the price I have to pay to have a phone that can also take high resolution pictures means that getting occasional emojis is probably for the best. Why does this really matter? you may ask. Well it matters because I just discovered that my new phone, an LG V40 ThinQ, aka my phone number’s Generation 3, has a dictation device attached to it, which means I can now record blogs and journals with my voice. I realize that some people already have this feature, and to them they may think, Oh yeah, that’s a big deal. And, of course, they’re being sarcastic thinking that because they haven’t spent the last nine years talking on a flip phone. But for me, a guy who does not normally migrate to 21st century technology, I think this is darn cool because I can crack my blogs out in a hurry, as well as anything I write, because, you know, when I record my voice, I just have to say it and it will happen and then I can go back and review for content later [which I’m doing now in the rewrite]. Does this mean I’m likely to create a mess for the first draft? Why, of course it does. Truth is I’m probably going to have a really messy first draft because I have to remember every punctuation as a word. For example, in order to craft the sentence I’ve just said, I have to actually sound out the punctuation like the word period. But that’s okay because I still think it’s cool that I can write anything I want just by saying it into my phone. It definitely saves a lot of time to get my ideas in print when I don’t have to chop away at a keyboard and make all of this noise, as much as I like the sound of a key clacking against keyboard. But the challenge, of course, is that now I can’t quite see what I’m typing as I speak because I speak better when I’m not looking at words racing across the page. Doing so otherwise means that I’m going to be self-conscious about what I’m saying and think that now I have to fix everything before I stop speaking. That’s not particularly practical. It’s worse when the microphone turns itself off and I don’t catch it until a paragraph or two later. Yeah, that would totally happen to me…if I don’t look at what I’m doing every couple of lines. In short, I’ve just typed over 550 words in about five minutes using this dictation device, and I think that is really cool. If you have a project you want to get done in a hurry, and you don’t want to take forever to write it, then you may want to use a dictation device as well because it goes like lightning and it is awesome and I think everyone should use it if they want to be productive and cool. Also, for those of you who are wondering where I’ve been lately, just read my last post, and you’ll see that I’m busy doing other projects and that I am going to be catching up on my blog some point soon, and this dictation device might be an incentive for me to do that. I guess it’s easy to say that maybe I will be more active here in the coming days or weeks, so if you are interested in more of what I have to say then please come back soon and see what I’ve written with my voice. I know it’s been a while since I’ve posted anything on Drinking Café Latte at 1pm, and there have been many occasions on which I thought it was time to post something, but I didn’t. As I’ve reiterated in previous posts, I find that I’ve got so much to write about that I spend more time doing the thing I want to write about than I do writing about it, so I end up writing and blogging about nothing. That’s been the case for much of the time I’ve spent away from here since last summer. I suppose that’s the difficult trade-off with blogging: I can write about anything, but if I also want to experience the things worth writing about, I gotta make the time for both, and there isn’t that much time in the day, especially if I want to experience a lot, and so I end up writing about nothing. I do have a series of articles in the waiting that I wrote last August, related to my “Adventures in Unity,” about my experiences learning C# on the Unity Engine and comparing it to the systems in place for the game engine I usually use to make games, the OHRRPGCE. I wrote four parts, but I never published any of them because I thought the OHRRPGCE audience was too small to warrant such devotion to the topic, and because I thought this blog has already dabbled in so many different topics that it’s essentially void of any topic, and no one’s going to read an article from a site that has no focus. So, I never finished the series, and I never published a single article from that series. I may decide differently when I’m further along in my “adventures.” We’ll see how it goes. In September, I got new screen recording and editing software and started recording gameplay videos for Game Dev Tycoon by Greenheart Games, an indie game about developing for the gaming industry, to try my hand at episodic programming on YouTube. I probably devoted five or six hours to each episode on average, maybe more, and found my time for other important things slipping away. I thought I’d see if posting gameplay on a more popular game than the ones I play for developers using the OHRRPGCE would attract a bigger audience. It didn’t. I started posting the videos this month, and, as of this writing, all four episodes that are currently online have a combined total of eight views, with most of those views lasting just a few seconds. There are four live and four on schedule for release Mondays at 1pm EST until December 24th. I’ve got enough footage to make at least eight more. I doubt that will happen now. It’s too bad. I thought I had made a pretty good show. In October, I spent a night in the hospital for severe pains I was having all over my body. That visit resulted in several follow-up visits with the doctor, one blood drawing with another on the way, and an upcoming appointment to receive an MRA scan (for arteries). October in general has been exhausting, the exhaustion has rolled over into November, and it looks to continue into December. That had its own impact on my desire to blog. I may still write a blog or two about the experience for those who are healthy and have no idea what they’re in for on the day that their body starts laughing at them. We’ll see. In every month since the summer, I’ve spent a lot of time watching the news. It’s a drug these days. I rarely watch scripted television anymore. I can’t count how many days and nights I’ve wasted trying to find out what happened each day. Those were hours I didn’t spend writing or doing anything productive. A part of it I regret. The rest of me thinks the news these days is must-see TV. I’ve been trying to get some momentum back into my fiction this month, and I will be talking more about that in the coming weeks, barring anything stupid getting any the way. So, that’s what the last five months have been like. I also haven’t been posting because WordPress will no longer forward my posts to my personal Facebook page. I don’t like change. 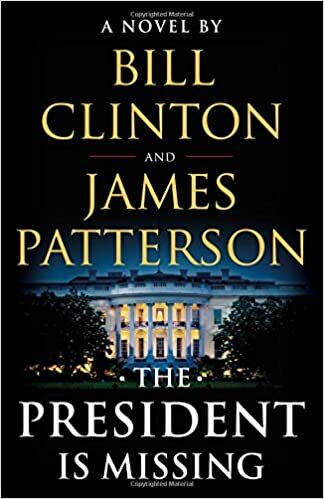 So, I haven’t posted a book review on this blog in a while–been meaning to–but today I’m doing just that with Bill Clinton and James Patterson’s novel, The President is Missing. At the same time, I’m debuting a new feature for Drinking Cafe Latte at 1pm that probably should’ve been introduced a long time ago: a recommended latte at 1pm! Or, just coffee, really. Or, some other lunch or beverage item to enjoy while reading this blog. Depends on the day. Let me know if you like this feature in the comments below. Hope you’re hungry. Roast turkey on panini (grilled bread), with a slice of provolone (cheese), some lettuce, black olives, mayonnaise, mustard, and oregano, served with a dill pickle. Enjoy with a hot medium (or Grande) cup of chai tea latte. Let me know if this works for you. Note: This review is cross-posted from Goodreads. So, as it turns out, The President is Missing is actually President Bill Clinton’s first novel, with James Patterson taking co-author credit (I’ve read somewhere that he usually takes over pacing and editing duties when he co-authors with someone, in effect leaving the main story in the other author’s hands, which I’m sure is the case here), so comparing this to other James Patterson novels is a nonstarter for me. I don’t know how much of his hand has touched how much of this book, or how this final version compares to his other novels. What I do know is that our former president has a decent command of the traditional political thriller while infusing potential real-world scenarios and potentially threatening situations into a terrifying warning about what could happen if we don’t guard our every door. Before I go any further, I want to alert readers to potential spoilers ahead. They’ll be minor and hopefully not that spoiled, but you may want to duck out in a moment if you want to be completely surprised by the story. If you don’t want to risk figuring out the story ahead of time, then I don’t want you to find out that the butler did it in the ballroom with the candlestick here. Okay, if you’re still reading, then you don’t mind a couple of possible spoilers. (They won’t be too bad.) So, I’d expect a novel like this, written from the voice of a former president, to speak a truth to the crisis situation he presents. Because the story’s plot focuses on an issue that I’ve personally worried about for years (again, this story comes from the mind of a former president), I find it especially unsettling how realistic the crisis presented as the obstacle could be. Sure, the event this focuses on is probably not going to happen. But, it could, and that’s what makes the novel frightening. Again, coming from the source, it makes me wonder if there was ever a time in reality when we were close to experiencing the catastrophe-in-the-making presented in this novel. I kind of doubt it, but still, I think it adds to the suspense not knowing if the threat was ever real. Coming from an authentic voice, the specter of speculation is constantly hovering over the reader’s mind. This authenticity, of course, has a negative side effect. It’s hard to separate the main character (POTUS, Jonathan Duncan) from the author (POTUS, Bill Clinton) enough to disbelieve that the two are uniquely separate. This is especially true when you consider that Duncan refers to former presidents, like Kennedy, Carter, and Reagan (but not Clinton, I’ve noticed–I was waiting for that one). So, the story follows a weird parallel universe situation where basically Duncan is elected instead of Trump, but for some reason has to deal with almost all of the same real-life issues (read the book to discover just how timely it is), not unlike the world-building in the televised thriller 24, starring Kiefer Sutherland (who I suspect would play Duncan in the movie, if a movie ever happens because why not?). Duncan is his own person, though, complete with his own unique backstory (here’s where the separation between Duncan and Clinton are evident–they definitely do not share personal histories), so we still get a story here and not just a political football in novel form. This president, it seems, has some problems. So, there’s that. Yet, there’s this underlying perfection happening in our hero that makes me wonder whether the president is ever truly flawed. Yes, he has external issues that plague him and his presidency, independent of the crisis at hand. But, internally, he seems to have it all together. Well, no, not internally in the emotional sense–he’s a wreck there–but internally in the intellectual sense. He’s ahead of everybody else, which makes the reader wonder if he really needs anybody in his corner. Like Sherlock Holmes or Scooby Doo, he seems to know what’s going on through his own cunning before even his best people know. Either that, or the narrator’s hand is so sleight that we aren’t given the chance to see his cunning in action until after he explains why he’s cunning. So, yeah, if there’s anything about the book I don’t like, and keep in mind the five-star rating (a begrudging five stars), it’s that the president, while justly knowing a lot, seems to out-think everyone at every turn, and at some point I no longer want to buy his character (again, considering the source). There’s something of an uber-righteousness to him that we want him to have, yet we have a difficult time believing is infallible, as his politics are too perfect, and nobody’s politics are perfect. It’s almost as if this character embodies every positive talking point from both the right and the left to form this political savior who may be a grade above the majority of leaders we elect. I appreciate the idealism coming out, but it turns a tense thriller into something kind of hokey. Also, the villain’s motivation is weak. Like I said, I give this book five stars begrudgingly. It’s entertaining, but there are also those drawn-out moments where I feel like the politician is trying to sell me on his politics. I think the story could’ve ended 30 or 40 pages sooner, and I’d be more satisfied with it. The truth is, as compelling as President Duncan’s speech at the end may be, I still prefer President Bill Pullman’s speech from Independence Day over it (which was delivered in 1996, during President Bill Clinton’s first term). So, yes, in spite of a few lame character issues, and in spite of what amounts to a mostly predictable outline of events (save for a few instances where plots are foiled at weird times), The President is Missing is a good read, and even an important read, as it presents a crisis that could happen, and outlines the consequences we would face if it ever did happen. It’s scary, but also informative. So, even though it’s cheesy at times, it’s still a valuable addition to the reader’s library, and one that serves a valuable reminder that we shouldn’t put all of our eggs in a single basket. Good job, Mr. President. Your first novel lands on both feet. I expect the next, hopefully less diplomatically-filtered novel, to be just as important to read. Let me know if you want to read more reviews like this one. I have a few cued up already. I read books from a variety of publishing dates, so some books may have been out for a while, but I think a late review is better than no review. How’s the sandwich and chai? Every so often I like to visit The Book Designer to find out what’s new in the world of indie publishing because trends change, people change, yet books are forever, except for when they’re banned, and it’s important to keep up with it all. It is through this channel that I discover not only ways to maximize my social media outreach, but also how to avoid or address problems like predator publishers, “Cockygate,” or anything that convinces me that no one is looking out for my best interest. Yesterday, I read an article through The Book Designer’s weekly wrap-up about Amazon’s new terms on content-stuffing, or the practice of packing e-books with “bonus materials” that equate to having multiple books in one in an effort to game Kindle Unlimited’s system that pays according to pages read, a practice which may ultimately result in “authors” directing readers to click to the end of the digital brick for some kind of bonus item (and force Amazon to pay the author as much as $15 for the click1, per the policies on pages read, or credited as read, and subsequent payment), and it left me with some opinions. In short, it’s a smart system for lazy people, and one can hardly fault the scammers who figured that out, but it’s also a harmful system for those who are actually trying to make a living on their art. The end result is that Amazon has finally banned this practice, after numerous complaints2, as it is unfair to other, more legitimate authors who want to make an honest buck. Of course, I doubt fairness is the real reason they banned the practice. At best, responding in fairness may be counted as a positive side effect to the solution to a greater business problem. No, we’re talking about Amazon here. Prevention of bad practices, it seems, stems first from a loss, and losing authors is not the sort of thing Amazon would ever need to worry about. I have a feeling the change in Amazon’s Terms of Service for Kindle products is related more to money than to author servicing, and, in this case, authors are there to make them money (while trying to also make themselves money, which is admittedly harder to do). How well authors make Amazon money is the topic of another discussion, and, well, money in general is the topic of another discussion. What I do want to talk about, however, is service, and, in this case, the product is the service. When we buy a book, we usually buy it to read it. Sometimes we’ll buy a paperback because we need something for the bus or the beach, and sometimes we’ll buy a hardcover because we need something to keep the door open. But, we buy electronic books, or e-books, because we need something to occupy our time without taking up much of our space. And, Kindle Unlimited, Amazon’s exclusive subscription site for indie authors and readers, is a purveyor of electronic books large and small (more large than small) that readers can consume quickly and cheaply without any bookshelf clutter whatsoever, and it provides these books on an exclusive basis, exclusive in the sense that these books are available only on the Kindle platform. For readers who don’t mind reading books by unknowns for a monthly fee (so, not exactly free but close to it), Kindle Unlimited is a great platform. For authors whom these readers read, Kindle Unlimited is an okay platform (if they don’t mind getting paid by the page read, which can be very, very little3). I understand why someone would want to game a pay-by-pages-read system. It changes the value of the book from a standard cost of purchase regardless of quality to cost of purchase or borrow (and worth) based on quality. Not everyone will have that book that everyone will want to read until the end, as much as we may want to believe the opposite. For me, I’m the type of reader who will generally read a bad book to the end to find out if it gets any better, and because I paid for it, I’m gonna finish what I paid for, dangit. But, if I’m not paying anything but a monthly service, then I’m much more likely to abandon a bad book in favor of searching for a better book, and if I get a bad book for free, well, I’m not reading that one, either. So, if I’ve written a bad book, it doesn’t change the fact that I’ve spent precious time writing that bad book, and I’d still want to get paid for it. Gaming the system to get something for that book is certainly tempting. But, it’s not ethical, especially if the money is coming out of a pool4 set aside for all authors enrolled in the KU program, especially if those authors are writing good books that deserve to be read and deserve adequate compensation for each page read. If we were to consider the proverb, “Do unto others as we’d do onto ourselves,” then we shouldn’t even be tempted by this practice of tricking readers to click to the end of the overstuffed book, especially if the book is larger than The Lord of the Rings Trilogy because it includes content that can also be bought separately from the tome in question. But, apparently some fake authors haven’t gotten that memo. My argument goes beyond the ethical issue, however. In fact, I shouldn’t have to explain why this behavior is unethical, or justify any time spent discussing it. The facts speak for themselves. Cheating legitimate authors out of fair compensation by tricking readers to click on a link that takes them to something else lame is just bad all around. No, my issue is with these fake authors’ unwillingness to present a quality book, both in appearance and in content. That’s the real crime. Well, it’s kind of a crime. The fraudulent practice of gaming a system for money is still the worst. But a bad book…that’s nothing to slouch at. As a consumer of literature, both fiction and nonfiction alike, I want to enjoy the experience of reading as much as I want to enjoy the story itself. This means I want to appreciate the feel of the book in my hands (so, no crappy paper textures, please). I want to find the textual layout pleasing to the eye. Even the typography should leave me with a positive feeling. I’m a fan of the Garamond font, just as I’m a fan of matte covers and embossed titles. I like chapter headings that punctuate the story. I even like chapters that add something extra, like famous quotes, illustrations, or even in the case of The Impossible Fortress, lines of computer code that not only combine to make a functional game but also summarize the plot points of the chapter for a truly complex approach to storytelling. As a reader, I want to like the book I’m reading. As a writer, this means I want to deliver a positive customer experience, too. When I wrote The Computer Nerd three years ago, I had what I thought were three great ideas: A homemade cover featuring my real-life desk and coffee cup, a computer-based font for the title and chapter headings, and a “post-credits scene” to give voracious readers a special surprise for reading the entire book. As it turned out, my cover was too dark for print and a bit out of standard for a thriller, and the font was way out of standard for a thriller. And that last scene? I never did get feedback on it, which makes me wonder if anyone ever saw it. My first review, most likely from a reader looking for a book on programming, not a marital thriller, came back with a single star. It was nearly the reason why I rethought the story’s entire premise and every “wise” decision I thought I had made about it. The stuff I learned afterward is what convinced me to rewrite the book under the title Gone from the Happy Place. I thought it was time to brand it as a new product. I even want to change the publishing elements to match the professionals closer. I care about my books. I care about my products. I want readers to like them as much as I do, and I want to like them, too. I rushed The Computer Nerd out the door, and the quality, while not awful, still kinda shows. I definitely would’ve done things differently in retrospect. It’s the reason that Gone from the Happy Place is even in-production. Personally, I think these book-stuffers and Kindle-gamers are hacks. These are not the kinds of people who care about products. They’re driven by the money, but they don’t realize that the money is only as good as the customers’ tastes, and a bad product will lose the customer. It’s too bad that e-books don’t come with return policies, especially in Kindle Unlimited, because return policies force proper customer targeting and the creation of competitive products. This isn’t to say that I like return policies for my products, and I certainly don’t love the idea of including one, but I still think they’re necessary for all content producers, as return policies keep us accountable to our work. If enough people return my books, I’d know there’s a problem with them. Either that, or readers think a store is a library and are basically jerks, too. But, I wouldn’t expect that from my readers. My readers are good people, wink wink. To get notifications on more articles like this one, please hit the blue “follow” button at the bottom of this page. I try to post a new article at least once a year. Maybe twice in a leap year, if there’s also a full moon. 1. Nate Hoffelder. “Amazon Updates KDP Rules to Discourage Book-Stuffing.” The Digital Reader. July 12, 2018. 2. This is a guess, but probably true, as it wouldn’t be much of a story otherwise. 3. Derek Haines. “Is Kindle Unlimited Pay Per Page Read Fair For Authors?” Just Publishing Advice. June 21, 2018. 4. Nate Hoffelder. “Kindle Unlimited Per-Page Rate, Funding Pool Up in September 2017.” The Digital Reader. October 15, 2017. I don’t get stage fright. Not usually. If I’m standing in front of a group of strangers to give some information about a service they could use or learn from (an occasional side function of my job in education), I typically turn off the part of my brain that cares what they think about me and just deliver them the info I came to deliver. Unless I’m coughing up a storm while my zipper is down, two things I tend to get under control prior to arrival at my speaking destination, usually, I don’t worry about how I’m received. The audience either cares or it doesn’t. Doesn’t affect me either way. Yet, the reverse seems to be true about my online presence. It’s usually more appropriate to answer questions in an unbuttoned pair of jeans (especially after a big lunch or dinner) online than it is in front of a live crowd, depending on the topic, I suppose, but the words I deliver online last much, much longer than what I deliver in person, and that can be scary when the words or information matters. In front of real people in real time, most of my audience will remember less than 10% of what I say, and if they remember me at all, they’ll likely remember me as “some guy who came to my classroom to tell me about grammar or something.” I’m not threatened by that. But, when I send a message on Facebook or a tweet on Twitter, suddenly my words are permanent and have scrutiny appeal. It’s a strange paradox to be sure. We all talk about how social media can mask our identities when necessary, giving room for transparency in our thoughts, especially if our name is “Anonymous” or “Some Dude,” and suddenly we’re titanium. We see it as license to spout off all sorts of nonsense because who’s going to associate it with our faces if they can’t see them? In fact, I find it especially paradoxical in the dating world (something I gave up on a long time ago), where approaching strangers for the intention of getting a date is somehow easier through a comment on a profile page and a follow-up wink (or maybe it’s vice versa—I’ve never been great at the dating thing) than it is in real life where the person of interest has to watch me stumble out the words she may never take seriously face-to-face. It’s strange how these same vehicles of delivery can suddenly flip the perception I have of people and vice-versa, depending on the topic. But masking identity isn’t always useful. In person, my audience gets to see my face. In personal relationships, that should be a perk. Hopefully. But online, what I look like doesn’t matter. What I say does, and now they have the option to not only hear my words, but to remember them. In person, I have the freedom to flub my statements. Online, I better get it right, and I better get it right the first time because they can go back and check, check, and check again, and they can fault me if they see the mistakes or inconsistencies in thought, or whatever. As a writer, it’s embarrassing if I mess that up, especially if what I say is in of itself embarrassing (or simply unimportant). Online, I have plenty of places and opportunities in which that embarrassing thing can surface. So, social media suddenly becomes a scary thing because that Facebook post about what I had for dinner isn’t just a Facebook post anymore. It’s an admission of guilt (even though I might see it as an attempt to engage an audience). Sure, I had a salad tonight. But I also had baked fish and mashed potatoes. And a sweet roll! To anyone who thinks I should be on a diet, I may have just incriminated myself. Sweet rolls have melted sugar on top, and that’s not healthy! How dare you promote bad health? And what of Twitter and its hashtags (also not healthy)? Is it possible for anyone to use Twitter without stirring up a string of controversies? Even with 27 followers and most of them being marketing robots, the risks of shooting myself in the foot are present if not inevitable. If I confess I had a sweet roll to a live crowd, they can at least watch me wink in jest as I deliver the truth. “Yeah, I had a sweet roll last night, and how sweet it was,” I say, as I pat my belly and gesture at how much of it is now sugar. (Note: What I eat for dinner isn’t actually anyone’s business.) Online, they may not even read that far. As a writer, I’m told I need to master social media if I want to get followers. Okay. It’s also suggested that I post regularly to Facebook, Twitter, Pinterest, Instagram, LinkedIn, Google+, MySpace, Hotmail, AOL, AOL Instant Messenger, Reddit, AltaVista, Match.com, Yahoo, Wazoo, Kazoo, and other things I’m probably just making up now, oh, and my blog!, and it’s too much to keep up with, yet posting builds an audience of readers, and I want to be read, right??? And everything I say must be timely, yet accurate, and interesting, yet short, and if I mess it up, I’ll lose the people, but don’t worry about that because even with ten different ways to shoot myself in the head, I only have to do it once to lose them, so don’t worry about it and just enjoy the process, as even players of Russian Roulette can be successful at times! I’m tired, and that’s just from writing the names of these platforms. As I read about new platforms I can use to expand my readership, something I’m desperate for, as getting readers is the hardest part of the writing process, and I’d probably have an easier time running for public office based on the experience I’ve had doing this (getting a date is still tougher for some reason, though I have no idea why, as I’m smart, handsome, idea-driven, rich—no, the opposite of that, sorry—funny…okay, this post isn’t about that), I suddenly feel intimidated all over again because here’s one more service I should sign up for to give my readers even more options for staying connected with me, even though they have enough information overload from everybody else who wants their attention, and the only way any of this matters is if they really, really want to hear from me. If the students I speak to are of any barometer, I’d think even those who need to hear from me probably don’t want to hear from me. They’re probably too busy thinking about their Facebook posts, and Instagram photos, and whether anyone will like them to worry about liking me. So, what can I say to convince them to listen? I suppose the keyword is “free money.” But, I don’t know. Social media already seems to fit that bill. If everything is free, then nothing is valuable. Including time. I value my time. And, I value my words. To be clear, I don’t actually mind social media. I see it as a great way to find out where people I used to hang out with ten years ago are vacationing. I’m not there with them, but I can feel like I’m there with them. It’s almost as good, right? At some point, though, I want new things to talk about, and I can’t vacation every weekend or devote hours of every day sending out social media alerts to the few people who might see it to feel some kind of connection to them. At some point, it’s time to meet face to face again. Real relationships are frightening, too, but they’re real, and they feel real. That adds to their value. The fact is, I read all the time about how important value is to people, and it’s almost scary how much that’s true. I’m not sure how valuable social media really is. My words are permanent, but are they being read? Here’s a picture of a moose you can look at while you contemplate the answer to that question. If you’ve read this far and want to keep reading this far, please remember to hit the “follow” button down there at the bottom of this page. And, don’t forget to leave a comment if you’d be so kind. It’ll stay online forever! Hello Drinking Cafe Latte at 1pm readers, visitors, lurkers, and boycotters! (I don’t suppose the last group is paying much attention.) I’m sending out a quick announcement that my novella Gutter Child has received a major update this weekend and is now live at most retailers (e-book only). This will be the definitive version of the novella. If the story receives another update (beyond typos or grammatical issues that may surface in spite of my thorough checks for both), it will do so as a novel under a different name and a different A plot. I don’t foresee that happening too soon, so if you want to read the story of a young man trying to solve the mystery of his heritage while attending the worst university in the country and filtering out lies along the way, then give Gutter Child a try today. It currently stands at 40,000 words (about 160 pages) and retails for $2.99. From July 1 – July 31, it will also be available at Smashwords for 50% off the retail price. If you get your copy, please leave a review at your preferred retailer and/or on Goodreads. You may also comment your feedback here or on the book’s dedicated hub page for additional support. Note: Updated version contains a mix of new and rewritten scenes, better balanced emotional arcs, improved descriptions, fixes to overlooked typos and errors, and a new section for Readers’ Group Discussion Questions. Changes to story amount to roughly 8000 new words. Today’s blog is brought to you by caramel coffee, Domino’s pizza, and the indubitable number 42. Please consume each responsibly. On this day, we should read notable fiction by Douglas Adams, perhaps from the legendary Hitchhiker’s Guide to the Galaxy, and focus maybe on the third book in the five-part trilogy, Life, the Universe, and Everything, where the answer to life, the universe, and everything is 42 (even though we don’t yet know the question). Or, if that’s not of our interest, we can read the new future bestselling thriller The President is Missing, about a president who goes missing, from acclaimed writers James Patterson and Bill Clinton (aka 42). Or, we can go the sporting route and watch the biography of Jackie Robinson, Brooklyn Dodger, baseball hall-of-famer, and MLB-wide retiree of the number 42, in the titular film 42. Or, we can watch Kiefer Sutherland as CTU field super agent Jack Bauer in the real-time political thriller series 24, where he stops terrorists in a single day, but watch it in reverse. Well, I don’t need to tell you what to do. Just remember that today’s number is 42. Celebrate accordingly. I may do so with candles and a chocolate cake. My blog is remotely linked to Facebook and Twitter, which I use to share news to my wide array of narrow masses. I also have other options I could link to, like LinkedIn, that I’m not yet connected to, but should probably look into and link to at some point, so that my blogs cry out rather than whisper to an audience of many, like you and other friends I could link to, to share links and other matters of shared interest, to keep the social media family growing even if we’re all technically isolated from real human connection. So, I want to see if I can tweet #hashtags from my blog’s log line to create and connect to a wider web of wisdom and wishes, which can in turn be linked to through LinkedIn and other go-tos, Facebook and Twitter being my current coexisting content curators, and potentially procure plentiful portions of ravenous readers, and maintain a social media pathway that includes apps like Path and Google Plus, plus whatever other crazy things that they may link to, not including Instagram or Pinterest, both of which have interest in instant images, not to be confused with instant messages, which are another form of social media not supported by this blog, along with Pinterest and Instagram, which are also, sadly, not supported by this blog. If this test works, please tweet me on #Facebook, or message me on Twitter to let me know if you like this link and consider subscribing to support content like this, even if you don’t know why you’re still reading it. Have You Forgotten About Your Control of Information? In two days, the European Union will be updating its privacy laws for marketers, content providers, e-commerce sites, etc. to its new GDPR standards (short for General Data Protection Regulation), and said marketers, content providers, etc. need to be up-to-date with the standards. On a quick mental scan, I don’t think I fall into any of these categories in a way that would violate the EU’s new terms, but just to be sure, I want to remind all of my subscribers that you can choose to receive updates via the “follow” button at the bottom of this page (so that it says “Following Drinking Cafe Latte at 1pm”), just as you can stop receiving updates by clicking it again (so that “following” turns to “follow”). You control your information influx, and the dial for that control is at the bottom of this page. Just so we’re clear, I don’t share your information, nor would I know how to, and that little green lock to the left of the URL is the proof that this site is secure, even if your information does somehow find its way here, which I’m pretty sure it doesn’t–not in any way that I’ve discovered. That said, I hope you’ll continue to follow this blog, as I occasionally have awesome things to share, when I have anything to share, and I’d hate for you to miss out on important announcements, like the fact that the European Union is updating its privacy laws and heavy fines apply to any business (in Europe or abroad) that does not comply by its rules. Just a reminder, you can follow Drinking Cafe Latte at 1pm by clicking on the blue button at the bottom of this page (or unfollow if you’re already following and you decide you no longer want cool blogs like this one). Likewise, you can continue to follow this blog by doing nothing if you’re already following it. Anyway, I like your readership, and I welcome your feedback, so feel free to hang out here with your 1pm cafe latte if you’d like. Cover image of my ebook "Shell Out"
Cover Image of my ebook "Eleven Miles from Home"
Cover image of my ebook "Amusement"
Cover image of my ebook "When Cellphones Go Crazy"
Cover image of my ebook "The Celebration of Johnny's Yellow Rubber Ducky"
Cover image of my ebook "Lightstorm"
Cover image of my ebook "The Computer Nerd"
Cover Image for my ebook "Cards in the Cloak"
Cover image for my ebook "The Fountain of Truth"
Cover image of my ebook "Cannonball City: A Modern-day Fantasy, Yeay One"
Cover image of my short story collection "Zippywings 2015"
Cover image of my ebook "Gutter Child"
Cover image for my ebook "The Fallen Footwear"
Cover image of my ebook "Waterfall Junction and The Narrow Bridge"
Cover image for my ebook "Superheroes Anonymous: A Modern-day Fantasy, Year Two"
Cover Image for my ebook "When Cellphones Make Us Crazy"
The stuff that keeps me awake at night.